6 decks weighed from 270kg-350kg full weight and 2 decks from 210kg-270kg full weight. average of lead 6 decks - 300kg full weight, bottom 2 decks 250kg full weight. Predominately Brahman Cross and Charbray with approx 45% Brahmans. Have been on agistment for 8 months now and have turned the corner and are firing ahead now on good green pick. these cattle have all had a 400 day HGP with approximately 100 days left before expiring. #7's, 12-18 months in age, percentage mouthed with only 6 head cracking 2 teeth, balance milk. all frame and no weight these little steers are ready to really start laying on the beef! out of a highly regarded Brahman Charbray Cow herd by River Glen Charolais bulls, these steers have fantastic genetics and and are well known to perform on grass and grain. these steers still have their work clothes on but have begun to rapidly move forward in the last month. Buffalo fly is prevalent with a number of steers showing fly bite, Vendor has sprayed with supona at time of assessment and an ongoing treatment plan is in place. approximately 3 months ago all steers were treated for internal and external parasites which seams to have picked them up very well. agistment contract is coming to an end, and vendor has decided to sell instead of renewing lease. dont miss this opportunity to put a line of steers together that have enormous potential for compensatory weight gain and all the frame and potential to grow into good heavy feeders or grass bullocks. 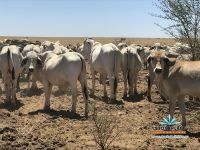 vendor Bred, Grey Brahman Steers ideal for export!